Ever wished you could have a little piece of Ireland without traveling across the pond to get it? As much as I would LOVE to take a trip to the Emerald Isle, it’s just not in the budget. Thanks to the Irish Store, though, I now have an authentic piece of Irish pottery and I didn’t even have to get on a plane! 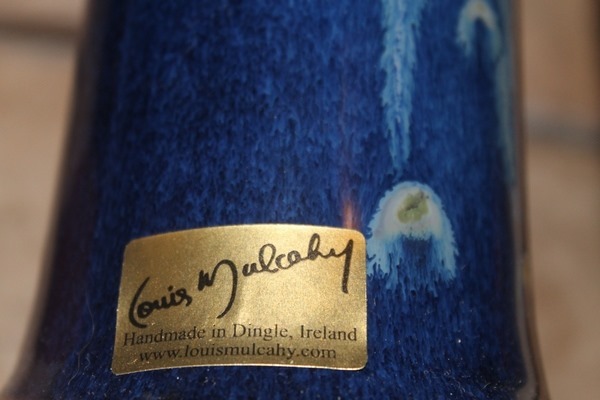 They sent me a gorgeous vase from artist Louis Mulcahy. Honestly, the picture doesn’t do it justice! 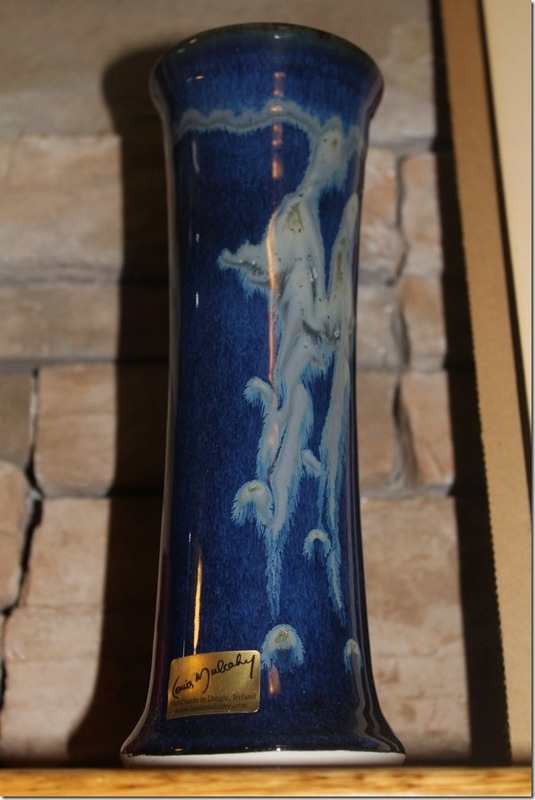 It’s just stunning in person, with rich blue hues complimented by swirling white accents. It looks positively beautiful on my mantle! Louis Mulcahy brings nearly 40 years of potting experience to his work. His one goal: to give the world gorgeous and authentic Irish pottery. I would say he met that goal. This handmade vase is perfect on its own. I haven’t added flowers to it because, honestly, I think they would detract from it’s simple beauty. This is truly a piece that I can pass down through generations, something that can become a treasured family heirloom. It’s even got a gold plate signed by the artist. As I said, the vase came from the Irish Store, an online shop that lets those of us who are dreaming of Ireland have a tiny piece of that dream (or a large piece, I guess, depending on how much you order!). Along with stunning pottery, they also have Irish food, clothing and so much more. Take a look at a few of my other favorite items from the store! Personalized Ogham Name: Have your name written in the ancient Irish alphabet and hang it on your wall! Silver Celtic Tree of Life Pendant: Isn’t it just gorgeous? I would wear this every day, and I’m not usually a big jewelry person. A box full of Irish treats? Who wouldn’t love that? I’ll admit, I couldn’t really get into most traditional Irish meals, but I’m definitely on board for the yummy treats! You’ll find these and so much more at the Irish Store. The great thing? It only costs $6.95 to ship from Ireland to the rest of the world. That’s it! Hey, that’s better than the shipping prices from US stores to US addresses most of the time! You really can’t beat it. They also guarantee low prices, so you’re not going to pay an arm and a leg to get a piece of Ireland. Whether you’re an Irish girl like me (part Irish, my dad was almost all Irish) or just love the look of gorgeous Irish home goods, you really want to check out the Irish Store! They’ve been delivery Irish goods around the world since 1987, so you know they have to be great! What would you love to get from the Irish Store?